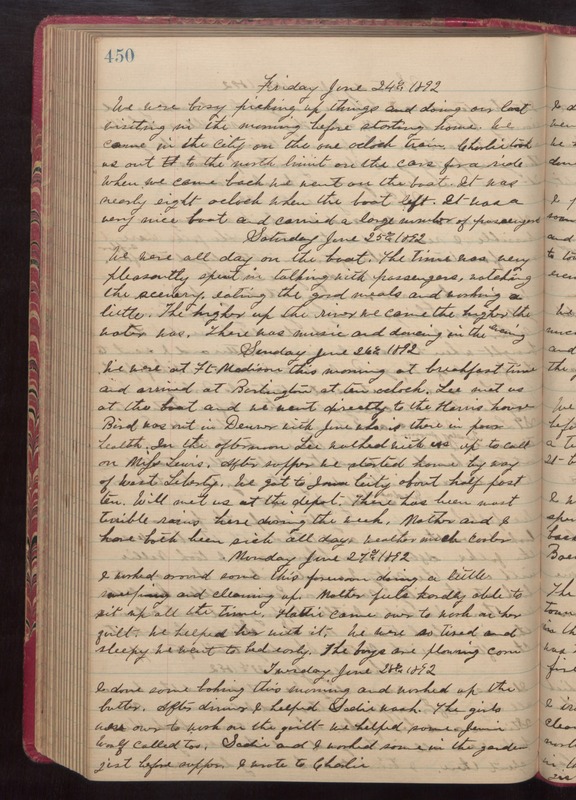 Friday June 24th 1892 We were busy picking up things and doing our last visiting in the morning before starting home. We came in the city on the one oclock train. Charlie took us out to the north limit on the cars for a ride. When we came back we went on the boat. It was nearly eight oclock when the boat left. It was a very nice boat and carried a large number of passengers. Saturday June 25th 1892 We were all day on the boat. The time was very pleasantly spent in talking with passengers, watching the scenery, eating the good meals and working a little. The higher up the river we came the higher the water was. There was music and dancing in the evening. Sunday June 26th 1892 We were at Ft Madison this morning at breakfast time and arrived at Burlington at ten oclock. Lee met us at the boat and we went directly to the Harris house. Bird was out in Denver with June who it there in poor health. In the afternoon Lee walked with us up to call on Miss Lewis. After supper we started home by way of West Liberty. We got to Iowa City about half past ten. Will met us at the depot. There had been most terrible rains here during the week. Mother and I have both been sick all day. weather much cooler. Monday June 27th 1892 I worked around some this forenoon doing a little sweeping and cleaning up. Mother feels hardly able to sit up all the time. Hattie came over to work on her quilt. We helped her with it. We were so tired and sleepy we went to bed early. The boys are plowing corn. Tuesday June 28th 1892 I done some baking this morning and worked up the butter. After dinner I helped Sadie wash. The girls were over to work on the quilt. we helped some. Jenie Woolf called too. Sadie and I worked some in the garden just before supper. I wrote to Charlie.